Joshua Goldstein is a director at the Center and our very own “Mr. Provocative.” In addition to his work with the Center, Josh is a writer and teaches a playwriting class in Boston University’s Creative Writing Department. He’s published several of his plays, poetry, and prose. Josh will post here on topics of interest and debate. Feel free to add your comments by emailing webmaster@centerforfinancialinclusion.org. The explosion of remittance transfers from people who have migrated to developed countries to their poor relatives back home has led to new wealth creation and a better standard of living for many. And this is, on the face of it, very positive. But I believe that there is a particular sorrow behind a considerable percentage of remittances that demands greater scrutiny and perhaps some kind of remedial action. The transfer of money is often made by families living under the great stress of separation—such as an absent mother supporting the small children she has left behind—an abandonment from which some never recover. 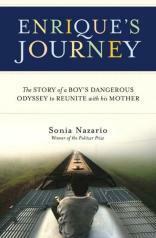 Enrique’s Journey, (2006) by Pulitzer Prize winning journalist Sonia Mazarin, is the harrowing story of a teenage Honduran boy who embarks on a dangerous journey, riding the tops of freight trains, to reach the United States in search of his mother Lourdes, whom he has not seen since he was five years old. He is, says Mazarin, one of an estimated 35,000 migrant children each year who sneak into the United States (many others are turned away at the boarder) with the dream of reuniting with a mother they hardly remember. Like countless other impoverished, single mothers, Lourdes left Honduras for the United States with the best interests of Enrique in mind. Hers is an agonizing decision, driven by economic necessity and the dream of a better future. Lourdes does find work, remits money regularly, and within a year or two plans to return to Honduras. But that last, critical piece of her plan is not possible. As a five-year-old, all Enrique understood was that his mother had abandoned him. His loss ultimately drives him to risk everything and head north to find her. But, after years of separation, the kind of perfect bonding he longs for with his mother is not achievable, leaving him bitter and confused. When impact studies are done about the value of remittances, it is inevitable that proxies for success like school attendance and increased consumption are used. And that makes sense. But poor people are as psychologically complex as the rest of us, and increased material well being afforded by remittances may be counteracted by the profound social dislocation and loss that children like Enrique suffer. (And what good is school attendance if a child cannot concentrate anyway?) As a first step, a public health campaign to educate migrant mothers about how best to communicate with the children they have left behind, in order to minimize the psychological damage, would be well advised. Transfers of money are no substitute for the daily reassurance of parental love that allows children to flourish, and that means doing more to keep families together. Microfinance institutions focus on serving people where they are. Made explicit in the mission statements of microfinance institutions might be something like the following: Working capital loans to the self employed poor sector make it possible for mothers and fathers to stay with their children. This is a very impressive achievement of the microfinance revolution that, in my opinion, should be highlighted more and is surely an impact that we should design studies to measure. It certainly is another powerful argument for exponentially expanding the reach of microfinance. Reading recommendation: Readers of this blog might also be interested in Edwige Danticat’s new memoir, Brother I’m Dying, which is filled with poignant passages about separation, loss, and the role of remittances in the lives of the Haitian poor.